Happy St. Patrick's Day! Although I consider this holiday to be on the fairly minimal side of the celebration spectrum, I still like to make it festive and fun because I love to part-ay! As I've said before, with three young chickies currently presiding my nest, I like to keep all of my kid friendly activities easy, cost effective and not too extensive. Because, lets face it, what's the point in putting a good little chunk of money and and a lot of effort into an activity that you know will probably last no more than 5 minutes before one kid is sticking something up their nose and the other is throwing a near demonic fit because you wouldn't let them use half the materials as nun-chucks instead of what they were actually meant for. So, I currently eat, breathe, and practically worship the phase: Less is More in almost everything that includes the participation of my sweet little chickies. 1) You only need 3 items to make it. 2) Part of it is edible, so you can count it as a snack. Not one that I would consider too healthy; but a snack none-the-less. 3) It is educational and helps improve fine motor skills (small things that kids do with their hands). *Playdough-I went for green since it's St. Patrick's Day. 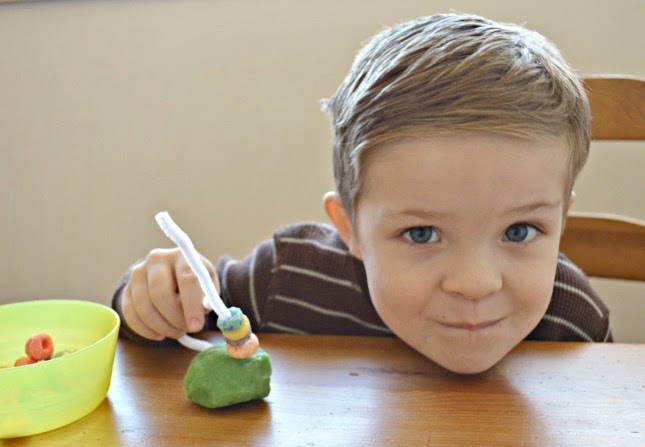 1) Form a small mound with your playdough. 2) Stick your pipe cleaners in your mound. 3) Show your chickies how to thread the Fruit Loops on to the pipe cleaners. 4) Sit back and have fun. 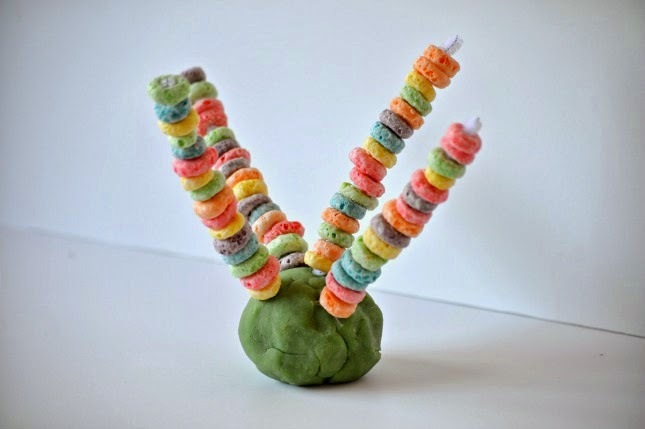 If your kids are older, you could have them make certain patterns out of the fruit loops as they place them on the pipe cleaners. Or, you could have them place a certain amount of each colored fruit loop on the pipe cleaner and then ask your children how many they have all together. "May you always be blessed with walls for the wind. A roof for the rain. A warm cup of tea by the fire. Laughter to cheer you. Those you love near you. And all that your heart might desire."